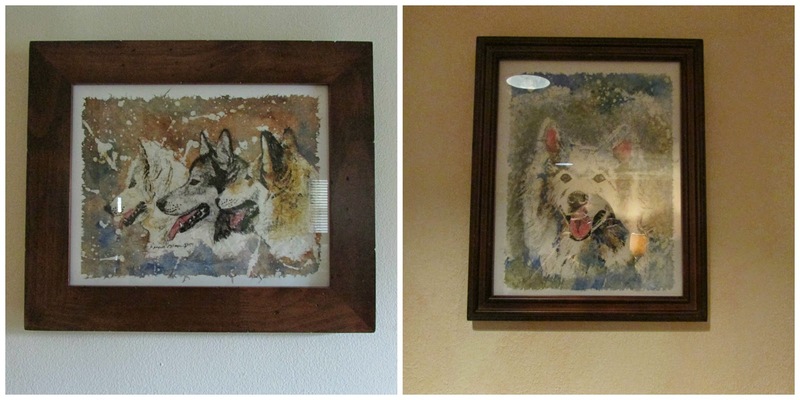 Recently, Kenneth at PetPics4U contacted me offering to make some custom art pieces for my home. After viewing his gallery, I was ecstatic. Kenneth is a San Antonio based artist who specializes in batiking. Using a photo, he draws an outline in ink on ginwashi paper, then applies melted wax to areas where he wishes no color to appear. Watercolor paint is then applied. I received my paintings in pristine condition, and was beyond thrilled. Included with the paintings are display and care instructions, and the display instructions came in particularly handy to me. These portraits are approximately 10" x 13", so a standard size. If this looks familiar, it is because Kenneth requested the original photos I used to make my blog header. I love this. It is shown here on the suggested white/light colored acid-free backer. For comparison, here is this piece without the backer. Using the backer/matting material makes everything "pop" out. He also sent me this lovely portrait of my princess, Neeko. Off to Hobby Lobby I went, where I easily purchased 11" x 14" frames and matting paper, and also acid free tape. The imperfect edges not only add to the character and beauty of these pieces, but also offer a little slack when attempting to center them. I immediately hung them. One in my living room, and one in my family room. I have already had guests over, who immediately commented on these pieces. They are beautiful, unique, and definitely a conversations starter. I admit that I am not the best photographer, particularly when glare is involved. If you are looking for beautiful, one of a kind custom art pieces, I highly recommend checking out his website or Facebook page. Disclaimer-I was given free product, but was NOT asked to blog about it. I am sharing my opinion because I feel these are amazingly beautiful pieces of art. Wow - those are beautiful - thanks for sharing, I 'll have to check it out. Those are just brilliant. We think they are just fabulous. Have a super Saturday. very cool!!! I like them with the backing for sure..just lovely! Very nice! I will swing over to their page! Very interesting. I'm not sure if I like the technique's look or not. The dogs look great though. So very cool! Big News!!! You won Gambler's Bday paracord giveaway. Let me know what kind of collar you want: a choker or buckle, what collar (one color or two) and measure the neck of the one you want it for and send me a email j_stancer@yahoo.com with your address and info. Those are really beautiful, and you did a very nice job of matting and framing them too. I recently had to photograph some artwork, and it is definitely challenging to do it without getting glare! Those are absolutely beautiful!!!!!!!! Love them!